Twilight-night doubleheaders, and even the traditional Sunday double-dip, are rarities in modern baseball. It used to be a rather inexpensive marketing tool for clubs, two games for the price of one. But eventually doubleheaders just faded away. More money could be made charging separate entrance fees for every game, so why not schedule games that way? In 1978 the Cleveland Indians played in 15 doubleheaders. The New York Yankees engaged in eight. It was in one of these games that a bit of baseball history was made. On July 26, the Tribe made their way to the Bronx to take on the Yankees in a four-game series. The Yankees were mired in fourth place in the American League East Division. They trailed front-running Boston by 8½ games and were actually closer to Cleveland, which was holding down sixth place, 16½ games off the pace. Of course, they wouldn’t be the Yankees if there was not a little bit of drama. Bob Lemon, who started the season managing the White Sox, was fired and resurfaced as the skipper of the Yankees when Billy Martin was ousted in July. In the opener of the series, Cleveland held a 1-0 lead heading into the bottom of the ninth inning. But Lou Piniella’s three-run blast off Cleveland starter Rick Waits in the bottom of the ninth inning turned that slim lead into a 3-1 defeat. Waits had no time to sulk after the game. He was due to appear at the NBC studios the next morning to appear on the Today Show. Waits, who was an amateur singer, had sung the National Anthem before Indians home games and was quite adept at belting out a tune. Later that day, the Indians and Yankees met for games two and three of the four-game set. The twi-night doubleheader was definitely a contrast of results. In the opener, the Yankees pummeled Indians hurlers David Clyde and Paul Reuschel. Clyde was battered for six runs in only 1⅔ innings pitched. Reuschel was not much better, surrendering five runs in 6⅓ innings. One of those runs was a monstrous home run off the bat of Reggie Jackson to lead off the home half of the fourth inning, his 15th round-tripper of the season. The Yankees’ Ed Figueroa breezed through seven innings, scattering three hits to pick up his 10th win in the 11-0 laugher. Between games, Indians skipper Jeff Torborg gave the team his best Knute Rockne imitation. “Between games I told them, ‘Let’s go out there and see what we’re made of,’” he said later.3 In the nightcap, southpaw Don Hood took the hill for the Tribe. The former Oriole had a 4-4 record with a 5.18 ERA. His opposition was Catfish Hunter. The future member of the Hall of Fame was in the twilight of his career; his record was 3-3 with a 5.08 ERA. Unfortunately for Hunter, the Indians had his number this evening. The right-hander could not find the plate, and the Indians made him pay. 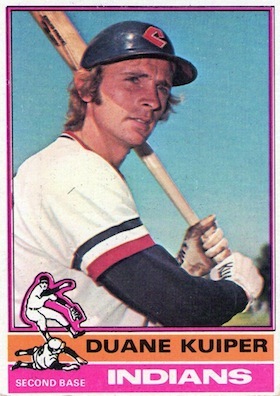 Jim Norris led off the game with a walk, and a singled by Rick Manning and a walk to Johnny Grubb loaded the bases for the Indians cleanup hitter, Andre Thornton. Hunter walked Thornton to force in the game’s first run. Consecutive singles by Bernie Carbo and Tom Veryzer tallied three more runs for the visitors. Hunter’s brief outing was over; he was replaced by Bob Kammeyer. Ted Cox greeted the rookie hurler with an infield single to load the bases again. Kuiper, the eighth man to bat in the inning, tripled to center to clear the bases and up the Indians lead to 7-0. The Tribe tacked on two more runs and led 9-0 after a half inning. Six of the runs were charged to Hunter. Cleveland added another run in the top of the third and five more in the top of the fifth inning to lead 15-0. The big blow was another bases-loaded triple by Kuiper. The Indians’ second baseman was not known as an offensive threat; the six runs he drove in doubled his previous single-game high of three. The rare feat of two bases-loaded triples in a game had been accomplished only twice before: by Elmer Valo of the Philadelphia Athletics on May 1, 1949, and by Billy Bruton of the Milwaukee Braves on August 2, 1959. The Yankees reached Hood for a couple of runs in the bottom of the fifth. But by that time, the game was over and the Indians had a knee-slapper of their own. Catfish rebounded, as did the Yankees. Hunter went 9-1 in August and September as the Yankees ended up in a tie with the Red Sox, each having records of 99-63. The Yankees defeated their arch-rivals in a one-game tiebreaker, and went all the way to win the World Series over the Los Angeles Dodgers in six games. It was their 22nd world championship. Besides the sources mentioned in the Notes, the author accessed Baseball-Reference.com for box scores/play-by-play information and other data, as well as Retrosheet.org. 1 Dan Coughlin, “Reggie is Back,” Cleveland Plain Dealer, July 28, 1978: 3-C.
3 Dan Coughlin, “Take That! Take That! Tribe, Yankees take turns battering pitching staffs,” Cleveland Plain Dealer, July 28, 1978: 2-C.
4 J. Carl Guymon, “Kuiper Cutting New Path With Hit Spree,” The Sporting News, June 8, 1974: 33.